It’s with pure joy I write this post- it’s the spring equinox! The last, long, cold, grey days of winter are past and we’re getting lighter and brighter every day. I love light and there’s something about spring’s sparkling light that’s especially dear. It’s clear and soft, and it makes me want to buy fresh flowers and replace my throw pillows in those amazing new shades of purple so trendy this year. 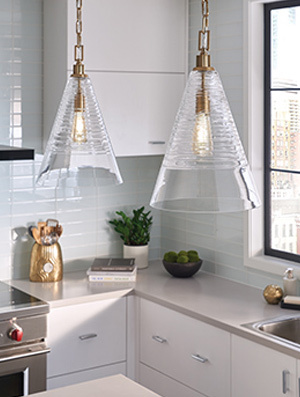 This year there’s another trend that instantly updates: glass and gold lighting, like this pic from Feiss of glass pendants with brass chain made of cool rectangular links. The texture of the glass is so gorgeous: the artisans that make them wrap glass rods around each glass shade to create that sparkle. Traditional in a timeless way, but also urban and eclectic, it just says perfection, no? New pendants over the island are a simple and fast update in your kitchen that will really make a difference. With that success under your belt you might want to replace the lights over your bathroom vanity or replace the lamps on your nightstands. We’ve added some inspiration for you on Instagram and Pinterest, do you follow us there? Many of the pics we post are taken at our customer’s homes, showcasing local projects. And sign up for our emails to get the news of sales and new blog posts. We offer a lot of expertise in lighting like coordinating different fixtures for a single space in an open concept house. Or emphasizing detail in a room’s décor that makes it even more special to those that live with our light. So, bring your pictures, fabrics, or inspiration and ask one of us for help with your spring update. Or, call ahead for an appointment with a lighting specialist at Madison Lighting. You can have spring’s light in your home all year round.